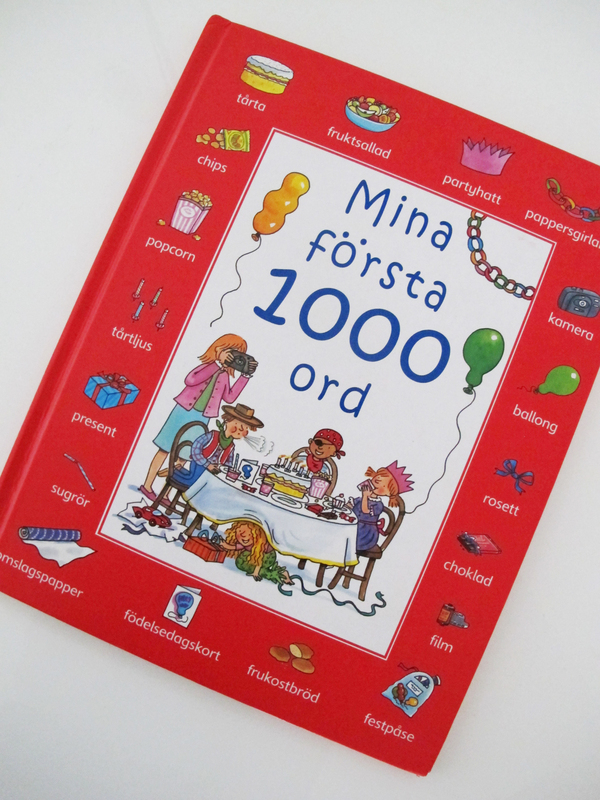 We had only lived in Malmö a few days when my sister-in-law Margareta stopped by for a visit and brought Mina Första 1000 Ord by Jan Lewis. It was a gift to my then one year old daughter, Elsa, and was also intended to help me with my Swedish. The book was an instant hit with us both. 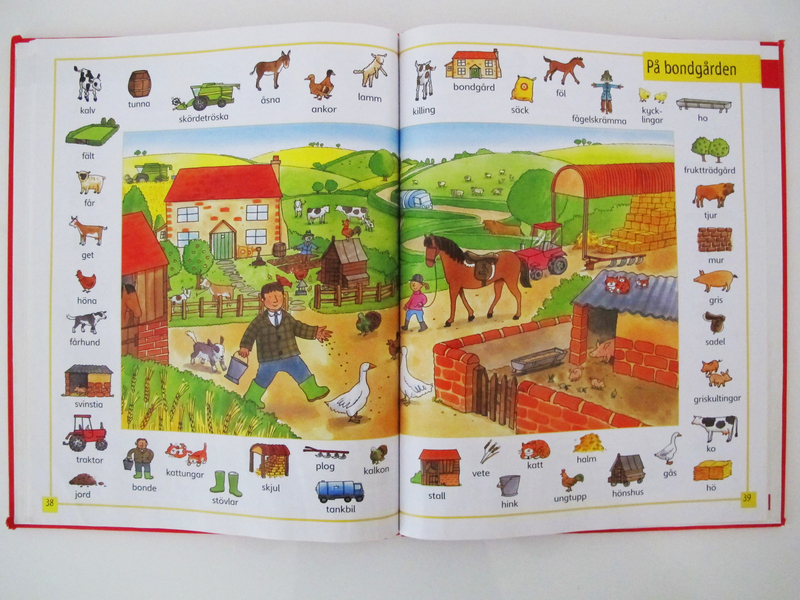 Elsa loved looking at the pictures and it was helpful for me to put an image with Swedish words. There are a few different kinds of pages in the book. Several are like the one shown below where there are images and words around the margin of a scene and you can play a game with your child as you point to a picture in the margin and ask them to find the image in the drawing, or vice versa. There are also pages where there are simply images of different sports, animals, opposites, colors, or parts of the body, etc. The drawings in the book are charming. Each one has such clarity and a sense of playfulness from the slide at the carnival to the sweetest little drawing of piglets. This book has provided hours of fun for our family. I’m a bit embarrassed to say I definitely don’t know all 1000 words yet, but I’ll get there…eventually. You can find the book in Swedish at bok.nu or in English on amazon.com, where there are also similar versions available in Spanish and French. The key is to find a copy that is illustrated by Jan Lewis because it’s the drawings that make this book so great. I highly recommend it for your own children, as a gift, or maybe even for someone who is doing their best to find their way through a new language like me. It would be the best way for me to learn the language 🙂 LOL!! 🙂 Seriously, connecting words with pictures have always been the best way to connect in the mind. I remember taking Richard Scary books to my six year old “cousin” in Sweden years ago. We’d look at the pictures and I’d say the word in English and she’d say it in Swedish and we both learned something! I can still picture us cracking up over gräsklippare. I don’t know why, but it tickled my funny bone! I’m afraid there are still many of the words in that book that I don’t know. But I’ll get there! It’s always interesting to see which words turn out to crack you up when learning another language.